Our next contributor in this year’s Halloween Horrors series is Sam Panico of the website BAndSAboutMovies.com. When not churning out daily (and, sometimes, even more frequent) reviews over at his own site, Sam can frequently be found contributing to the Drive-In Asylum fanzine, along with a few other of our contributors. However, readers of last year’s Halloween Horrors series, or readers of Drive-In Asylum already knew. Hey, nothin’ wrong with reminding you again! And when the Halloween Horrors series comes to a close at the end of October, be sure to head on over to BAndSAboutMovies.com on November 1st for the start of their own multi-contributor series spotlighting the 50 films found on Mill Creek’s “Chilling Classics” collection. Quite a few of this year’s HH2018 contributors will also be taking part in that series, including myself, Jennifer Upton, Groovy Doom, Valley Nightmares, and Camera Viscera! 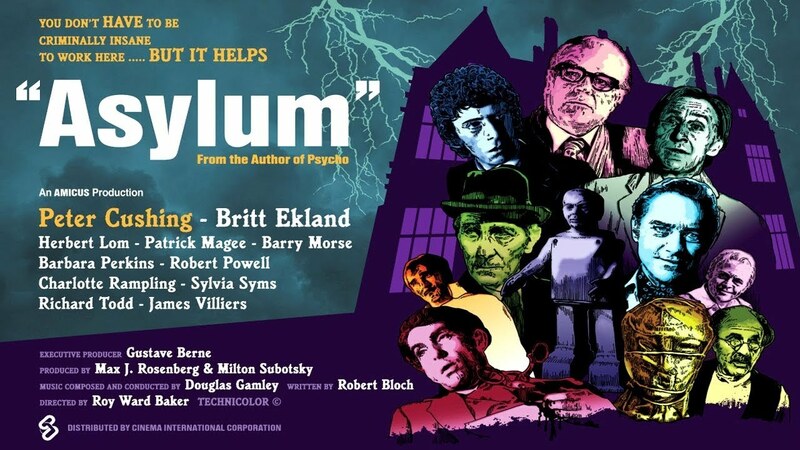 For his second year’s submission to our little series, Sam spotlights the second anthology (of four) in this year’s series, Amicus Productions’ 1972 shocker Asylum! The best lines make you say, “And then?” Or even better, “Why?” Why would I come to the asylum? Why would I want to get killed? I need to know more. I need to watch this movie. Asylum is a movie of pedigree. 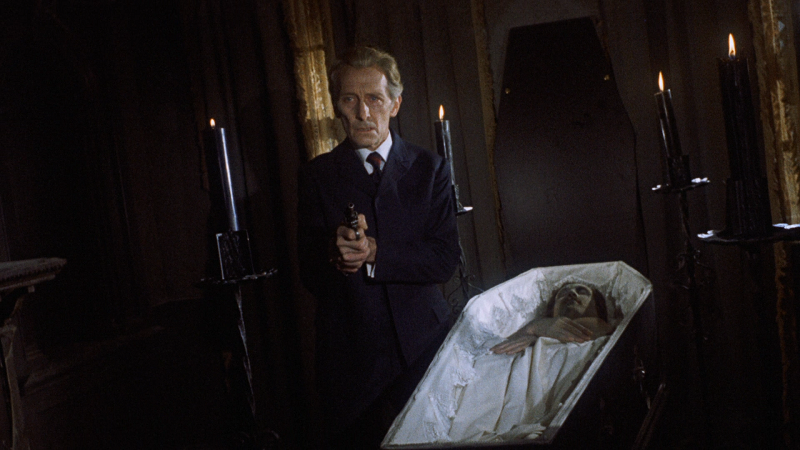 It comes from Amicus, the studio that made portmanteau horror their toast and baked beans. It’s written by Psycho author Robert Bloch, who based the script on several of his short stories. And it’s directed by Roy Ward Baker, whose films Quatermass and the Pit, The Vampire Lovers and The Vault of Horror belong in every media collection. Asylum breaks the mold by presenting its tales within a secluded home for the incurably insane. 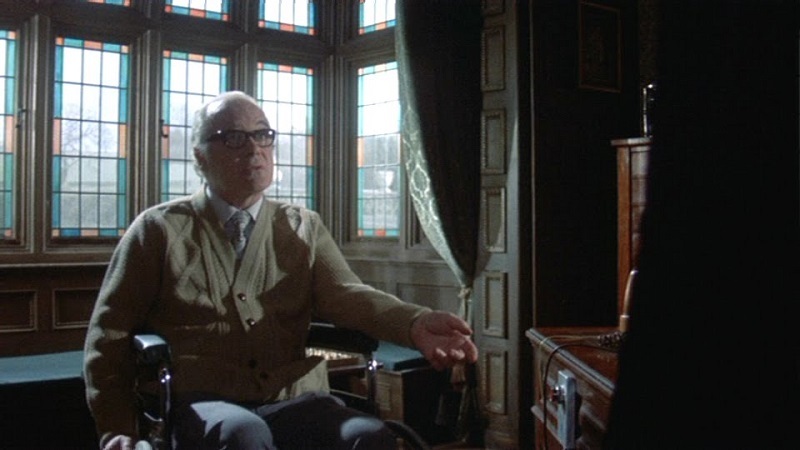 Dr. Martin arrives to interview for a position when he’s met by Dr. Lionel Rutherford, who is in a wheelchair thanks to an attack by inmate Dr. Starr, who was once the head of the place! If Dr. Martin can deduce exactly who Starr is from a series of patients, the job is his. The first tale, “Frozen Fear,” is a very by the numbers EC Comics affair, with butcher paper wrapped body parts suddenly finding a life of their own. Yet, “The Weird Tailor” is when Asylum picks up speed and runs toward brilliance. A tailor, on the cusp of losing his shop, accepts a strange job from an even stranger man, played by Peter Cushing. 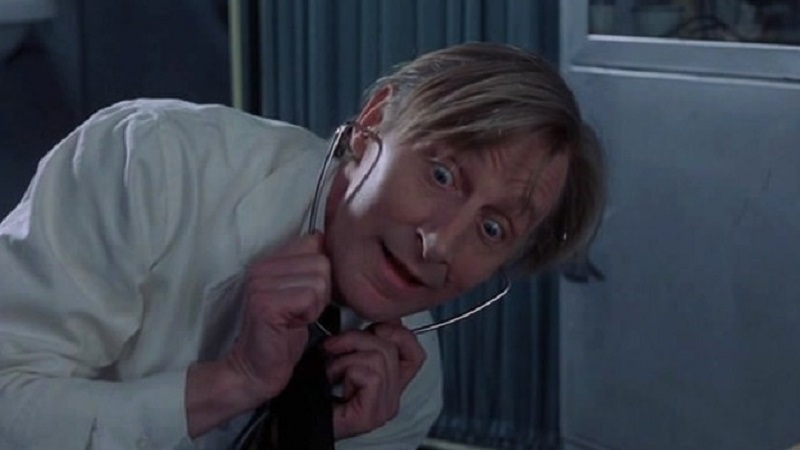 There’s a feeling I get when Peter Wilton Cushing, OBE appears on screen. It’s a return to childhood, remembering afternoons and late evenings watching endless Hammer movies with no adult cares, as well as that moment of excitement when I recognized him in Star Wars. Here, as a man who has lost his son — Cushing was no stranger to loss, never getting over the death of his wife — he implores the tailor to create a suit for him, one with instructions that must be followed without question. The denouement of this episode still gets me every single time. This is pre-CGI practical magic creating sorcery on celluloid, an utter moment of strange beauty mixed with otherworldly dread. The ending of “Lucy Comes to Stay” can be defined in the first few moments, but when you have Britt Ekland and Charlotte Rampling on screen together, something so trivial as an easy to divine twist is simple to get over. Finally, in “Mannikins of Horror,” soul transference and strange toys come together to create a nightmare for everyone left in the four walls of the asylum. And when the reveal of Dr. Starr happens, even the most jaded of fright fans may yet be surprised. Remember – nobody gets out of the Asylum unscathed. I may own thousands of DVDs and blu-rays, yet Asylum always gets played in our home, on nearly a once in a month basis. Why? Because it never loses its weird edge. How many films do you know that are about small robots filled with noodle like guts stabbing doctors with scalpels while glowing suit wearing mannequins stalk the screen? And how many combine frightening moments with an ongoing theme of mankind’s tenuous grasp on sanity and identity? I can think of one. And you just read about it.